The Association of British Studies — informal association of Russian specialists in the history of Great Britain — represents this issue. Its name is not accidental, but quite symbolic. The British World is presented through the chronologically and also through the thematically principle. Such approach of historians has proved its effectiveness in previous editions, because it allows us to treat the origin and formation of phenomena and institutions, causal relationship of the development of the British world, to reveal its features. The issue is published in the year announced by the governments of Russia and Great Britain as the Year of Cooperation in Science and Education. The governments of both states are going to pay special attention to the creation and strengthening of ties between scientists, businessmen, and politicians. An analysis of the accumulated experience of such cooperation between historians is presented in the first paper by Lorina Repina. The editors arranged the material in chronological order from the Middle Ages to the 21st century. However, the attentive reader can identify problem blocks. Among them, an important place is occupied by materials that have a production character. First of all, this is the paper of the famous historian — Sergey Fyodorov. It dedicated to the problem of the genealogy of the Alpinids and the political development of Alba in the 10th — 13th centuries that was not studied in Russian historiography. In the article of Anastasiya Palamarchuk posed the problem of the relationship of compositional monarchy and legal polymorphism in early Stuart England. Particular attention is paid to the mechanisms of stability of ethnocultural and ethnopolitical diversity in the country. Section of New History is opened by the paper of Tatyana Labutina. It highlights the state of study of the problem of the English Enlightenment in the domestic and foreign historical science at the turn of the 20th and 21st centuries. The author focuses on a number of issues in the research of scholars that cause discussions (the concept of “Enlightenment”, the chronological framework of the Enlightenment movement in England and its national characteristics). In particular, T. Labutina concludes that in recent years the English Enlightenment has been thoroughly studied by Russian scientists, as well as the appeal of historians to the new problems. At the same time, the article highlights some problems that remain unresolved. Their solution the author sees in complex interdisciplinary researches with the involvement of specialists in various fields of humanitarian knowledge. 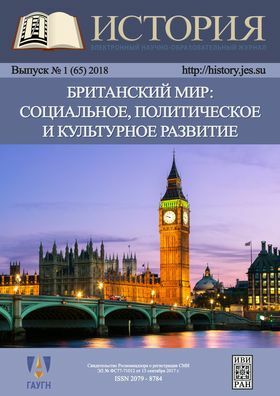 The paper of Andrey Sokolov is devoted to one of the most discussion problems in historical science namely the origin of the middle class in England in modern times. Special attention was paid to the discussions of historians on the issue, whether the middle class was a social reality or a construct of public consciousness. Significant is the block devoted to colonial and foreign policy history. In his article Yury Akimov studied the initial period of British colonial rule in Nova Scotia, from time of conquest until the end of the 40s of the 18th century. The author analyzes the specifics of the management system created there, reveals the problems faced by the colonial administration. The article by Irina Khruleva is devoted to the religious movement of the British colonies in North America on the eve of the war for independence. The analysis of the first “Great Awakening”, proceeding in parallel with the Enlightenment movement, allowed the author to come to an important conclusion about his intercolonial character, the formation of a single religious and partly ideological space for the eve of the war. In the paper of Sergey Demidov analyzed the activities of Robert Cecil in developing the official position of Great Britain. A detailed account is taken of the history of the creation of the report of Philimon, the various positions of British leaders and the debate in government circles, as well as the impact on them of public opinion and mass organizations in support of the League of Nations. The Foreign politicy became a subjects of the article by Kristina Minakova. Author describes the course of the post-war negotiations of the winning countries, when the issue of establishing an international trade organization was seriously considered. In the paper of Dmitry Portnyagin considered one of the most controversial problems in domestic and foreign historiography - the question of the causes of the “cold” war. The author focuses on the role of Great Britain in the confrontation that began after the end of World War II. Claiming to maintain the status of a great power, Britain sought to play an active role in the international arena. The implementation of this line in practice, the author believes, was planned, among other things, by using economic resources and the military potential of the Commonwealth. According to the content, this block of articles is completed by Evgeny Sergeev. The author highlights the main moments of the transformation of the structure, personnel and methods of activity of one of the most important state agencies of the United Kingdom — the Foreign Office (Foreign Office) in the key period of restructuring the system of international relations against the background of the genesis of the Versailles-Washington world order. Professor E. Sergeev showed that the beginning of the 1920s. Was characterized by new global and regional challenges faced by the British power elite in an effort to adapt the metropolis and its dependent territories to the realities of the next round of geopolitical rivalry between the powers. Various scenes of social and cultural history were examined by Elena Makarova, Marina Aizenstat, Regina Valeeva and Nelli Karkozashvili. In the articles of Elena Makarova and Marina Aizenstat proposed a new look at famous topics. Thus, in the article of Elena Makarova, the image of London in the paintings and engravings of an English artist of the 18th century by William Hogarth is analyzed. And Marina Aizenshtat analyzes the place of correspondence in the political and everyday life of the British of the 18th century. The author showed the importance of attracting correspondence in the study of the history of the country. The modern cultural policy of Britain, the general trends of British cultural diplomacy and Russian-British relations in 1992—2010. Examined by Regina Valeeva. The material of Nelli Karkozashvili, which presents the peculiarities of the social structure of the USA in the first half of the 19th century through the eyes of British travelers, is not without interest. A special place in the collection is given to the political history of Great Britain. Article by Mikhail Zholudov is devoted to the consideration of the participation of “philosophical radicals” in the struggle for parliamentary reform in 1832. Professor Tamara Gella analyzes the history of the Liberal Party of Great Britain at the turn of the 19th century. The author raises questions about the “crisis” of liberalism and about the development by the liberals of new program provisions. At the center of her attention are the views and positions of the right-wing liberals on the solution of the working question. Continuing the study of the history of the British Communists Aleksander Prokopov. In his article, the general elections of 1935 are analyzed through the prism of the tactics of the English Communists. And Elena Ananieva examined the domestic and foreign policy implications of the parliamentary elections in the UK in 2015. Elena Polyakova, which examined the development of the process of constitutional change in the United Kingdom in the late 20th — early 21st century. The author focused on Northern Ireland, in which devolution faced the greatest difficulties. The editors believes that the reader will find in the present issue as posing of new problems, as discussion questions, and consideration of specific plots, everything that expands also enriches our notion of the British world.